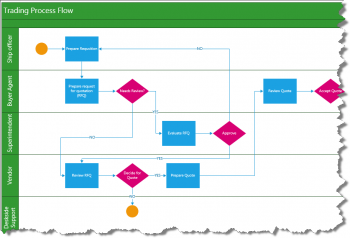 The BPM-X® tool translates Visio® business process diagrams into a set of test cases. This business process driven testing approach is also known as model-based testing (MBT). MBT runs an analysis of the process diagrams and calculates the set of possible process execution paths. The number of generated paths is controlled by fine-tuned test-cases coverage algorithms. Each paths is converted by BPM-X® into a valid test case with test steps (also known as test script) to be conducted for test execution. The test cases include data for functional requirements, test and execution hints, execution roles and much more test related data. This approach is a white-box testing and is used for user acceptance testing (UAT) in the scope of integration and regression testing. This video shows how easily Visio can be combined with testing platforms such as Hp QC / ALM. Establish project governance and controlled change-request management with sophisticated analytic reporting of business process models, test cases, requirements and data. For the management of test-cases and requirements, the leading tool HP ALM is integrated using REST web services. There is support of HP ALM 11.x and 12.x including cloud. The test cases are linked to functional requirements for managing the requirements coverage. For the next release of test-cases generation our R&D team is developing the automated calculation of logical pre-conditions to determine valid data for test execution. Today it is quite impossible to manually oversee all logical conditions to select the right testing data for the execution of a specific path. The mentioned new feature will automate this process and significantly lower the efforts to determine the right data for testing. Free trial licenses to be requested.